Luxury suites with hot tubs, cable near the Natural Bridge. The Chalet is part of Quiet Waters Cabin Complex: 5 cabins connected by wooden walkways and staircases. It is a great choice for lodging near the Natural Bridge State Park, restaurants along Highway 11, popular trailheads and other tourist activities. The cabin has two floors with the bedroom located in the loft. The cabin can sleep up to four with a full size futon in the living room. It is approximately one half mile from the trails and recreational area in Natural Bridge State Park and from Hoe Down Island and the swimming pool. An excellent choice for a couple or a small group of friends looking to stay close to main features of the Red River Gorge. 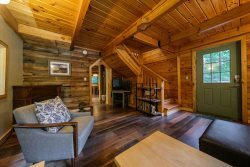 The Chalet comes with a hot tub on the deck: public wooden staircases of the complex as well as Middlefork Lodge are within clear view of the deck and hot tub. If you seek a more private deck we recommend Butterfly Suite. The cabin includes toilet paper, pots, pans, dishes, dish soap, dishwasher soap and hand towels. There is an oven, a four burner stove, a coffee maker, a microwave, a refrigerator, and a toaster. Also, there is an electric grill on the porch. We supply sheets, blankets, pillows and two towels per guest. BRING your own salt, pepper, cooking oil, paper towels, soap and shampoo. There is a small family cemetery in the grassy area next to the cabin complex.